With a crash, bang, magic wands and a wallop Danny O Connor, Alan Mcgee, Paul Mcfadden and Mark Gardener hit Gothenburg Film festival for the weekend and 3 sold out "Upside Down" screenings and Q+A sessions. With a wave of his wand to the crowds Alan weaved his magic on the DJ decks to close the film festival in the early hours of Sunday morning. As rivers and seas of ice eerily crept pass the club into the cold darkness outside of the scandinavian night, inside the club, all was hot, rocking and steamy. As the dancing public got groovy and made some shapes on the dance floor some people hit the stage to encourage Alan's magic onwards and upwards. Somebody even took a backwards tumble off the stage and ended upside down in a bass bin speaker cabinet. From the flailing legs and boots that could be seen coming out of the top of the cabinet some even thought that it could have been Danny the director of Upside Down ? "With those boots, definitely not " I told them ! The spirit of Creation records lives on and remains strong. 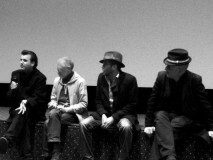 In the picture from left to right: Danny O Connor, The Swedish interviewer, Mark Gardener and Alan Mcgee.